Diary of a Psychic Healer: Your Crystal Cracked - Now What??? Your Crystal Cracked - Now What??? We have all been there; crystals crack, especially when we use them for healing. It starts with small fissures on the inside that let us know they are working. Or in the case of amethyst and citrine crystals, the colors fades with time - or in just a few weeks, it depends on how much energy they transmute. When a crystal cracks, we thank it for its healing vibes and put it back into the earth so that it can recharge its energy and eventually be reabsorbed by the natural cycles in the earth. Can We Keep Them From Cracking? Clear new crystals by putting them on a bed of sea salt for 2 hours. Then hold it in your hand and fill it with divine light, asking that it keep it clear and full of energy on a daily basis. Rinse regular-use crystals with water at least once a week, and then fill it with divine light again to dedicate it's energy. Keep your crystals in a cool dry place, out of the sunlight to preserve their color (especially important for rose quartz, amethyst, citrine and other varieties that lose their color). 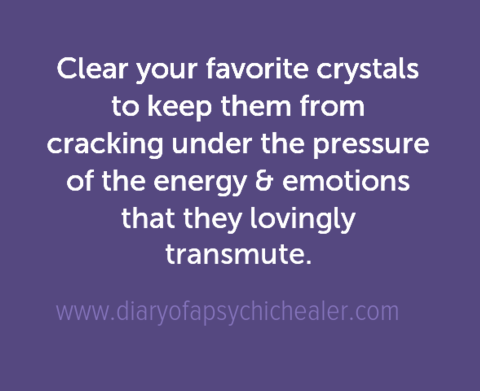 Tune into the crystal's energy and give it a break when it needs one, burying it in a potted plant for a few weeks or months. This last suggestion is vital. We can get a feel for a crystal's energy levels by holding it in our left, receiving hand, and sensing its energy levels. They crystal's energy might say "give me a rest!" in which case you might bury it in a potted plant for a month. 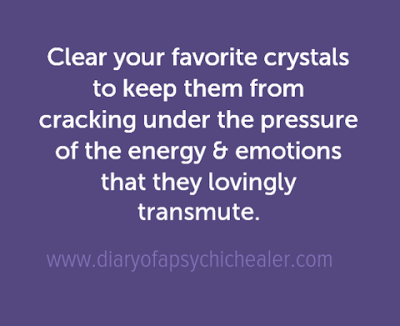 Taking care of crystals keeps them with us longer. When the crystal is ready to come again it will pop into your mind. You can feel it's energy with your left hand. A few months ago I was wearing a lapis lazuli pendant and a moonstone bracelet and they both fell off their silver chains the same day - a sign that they needed some rest as I had been wearing them for months without a proper rest. 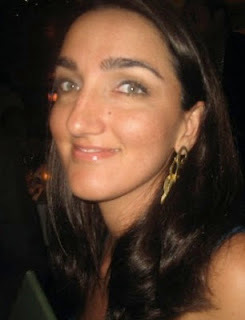 Crystals that are worn as jewelry may need more rest and cleansing because so many people admire them on us. Take care of your favorite crystals and they will be with you for a long time.